All Ralph has ever wanted is to be in the theatre, but in a working class family in the aftermath of the Second World War, such desires are looked on with suspicion. Everything is against him: his prejudiced, misguided father, his stressed mother, his poverty-stricken background and his lack of training. But Ralph is determined, and the sheer grit that he has inherited from his father puts his dream within reach. Can it also give him the courage to seize it? ” Michelle Magorian’s Cuckoo in the Nest is the spirit of immediate post-war Britain, well evoked in this satisfyingly long novel. If J.B.Priestley had written a teenage story the result could well have been something like this. Sixteen-year old Ralph wants to work in the theatre but his authoritarian working-class father will have nothing of it. They fight their battles over the heads of mum, siblings, aunt and cousin all squeezed into a tiny house left behind in a bomb-damaged street. Outside it rains and snows; within, domestic tensions provide different storms. The one beacon of light is the local repertory theatre where Ralph gets a job as a scene-shifter and occasional actor. 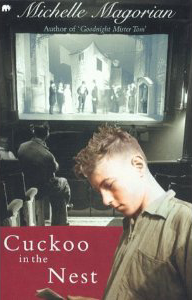 “I must confess to starting Cuckoo in the Nest by Michelle Magorian with a sense of disappointment just because it was not Goodnight Mister Tom, her novel for slightly younger children about a wartime evacuee, which for me is one of the best children’s books ever written. It also doesn’t help that this is a novel (a thumping great tome in fact) about a working-class boy’s determination to work in the theatre: written by an ex-actress, you think it is bound to appeal only to similar fledgling luvvies.